Big Pooh is an emcee that really doesn't need an introduction. Along with Phonte and 9th Wonder, Little Brother changed the face of North Carolina Hip Hop forever. Their debut album The Listening is a certified classic, which lead to the group blowing up beyond anyone's imagination. However, while Phonte and 9th Wonder received most of the attention, Big Pooh was left feeling underappreciated. Thankfully, his debut solo album, Sleepers, proved to the world that Big Pooh is much more than a sidekick. MVRemix chatted with Pooh about Sleepers, as well as Little Brother's up and coming album, The Minstrel Show. MVRemix: Your debut album, Sleepers, has been out for a minute now. So have you been pleased with how the album has been received and the reactions you have gotten? Big Pooh: Yes, I have, been getting a lot of good reviews and a lot of positive feedback from people about the album so far. MVRemix: What was your mindset like going into this album? Big Pooh: Just to make the best possible album I could. I knew there were a lot of doubters thinking that I couldn't make an album by myself, or make an album that sounds this good by myself; but I made it happen. MVRemix: Do you feel that people overlooked you at first, in comparison to 9th and Phonte? Big Pooh: Yeah, that’s the feeling I had for a while. It’s like playing on a team with Magic and Kareem and your name is James Worthy. MVRemix: For fans who may have not heard Sleepers yet, can you talk about the topics, concepts, and issues you have on the album? Big Pooh: The album topics and concepts ranges from family issues, to people not giving me the props I felt I deserved, to just spitting. I tried to talk about a variety of things on the album to make it a complete album. MVRemix: What is the toughest part about being in a group? Big Pooh: It has to be dealing with three different personalities. All of us are very opinionated guys so you can imagine when we all don't agree on something what that would be like. 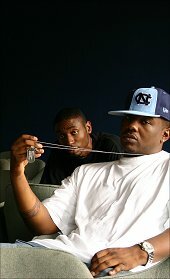 MVRemix: How does it feel to have opened the door for North Carolina underground Hip Hop, as now the entire Justus League, and people like Splash are getting national recognition? Big Pooh: It feels good that we were able to open the door for other cats in NC. It’s really a great feeling knowing that members of my crew are living their dreams and that we helped play a part in that. MVRemix: Looking back, I can't remember an underground act blowing up as fast as you guys did. So were you taken back when it all happened? Were you shocked? What were you initial thoughts? Big Pooh: I was taken aback at first with how fast it happened. But I wasn't shocked, because I knew that we had dope product, I just didn't expect for it to take off so fast. MVRemix: Moving onto The Minstrel Show, do you guys have a release date yet? Big Pooh: Early September 2005 (9-13-05). MVRemix: Why the title The Minstrel Show? Big Pooh: Because that is what hip hop is becoming. All people see are these over exaggerated images of what they think black culture or hip hop culture is. We just want people to wake up and take notice. MVRemix: What can fans expect out of this album? What types of topics, issues, and concepts are you and Phonte addressing? Big Pooh: A more mature Little Brother is what this album is all about. The things Phonte and myself are addressing on this album are what we always address, what’s going on in our life during the time between The Listening and now. MVRemix: Do you feel any pressure to succeed with this follow up, since The Listening is pretty much a Hip Hop classic? Big Pooh: A little pressure. (Laughter) We put more pressure on ourselves than anybody could ever put on us to do better than the time before. I feel good about this album though and I don't think anybody will be disappointed. MVRemix: 9th Wonder has been hailed as one of the best producers in the industry, but he has also received his fair share of criticism. The big one is his drum pattern, which many feel is the same on every song. Do you have any thoughts on this issue, which never seems to die? Are the beats on the Minstrel Show going to prove the haters wrong? Big Pooh: Obviously I don't have a problem with it. Phonte doesn't have a problem with it. HOJ or J. League doesn’t have a problem with it. Jay-Z doesn't have a problem with it. Destiny's Child doesn't have a problem with it. Memphis Bleek, Obie Trice, Rueben Studdard, Mos Def, none of them has a problem with it. Get the point?? MVRemix: You guys also have The Chittlin Circuit Vol. 1.5 dropping soon. Tell us about that? Why the re-release? Big Pooh: Koch called and said they wanted to put it out, but we had to change a couple of tracks so we went back to the lab and put a bunch of new joints on it to give people the incentive to go out and get this one even if they brought the first one. Big Pooh: The business of the music business is always a headache. MVRemix: What else do you and Little Brother/Justus League have going on in the future? Big Pooh: Little Brother "The Minstrel Show" coming in September, and 9th Wonder's "Mr. Dream Merchant V. 2". Also, L.E.G.A.C.Y's Project Mayhem and The Away Team's National Anthem are both out now. And if you have not copped Sleepers what you waiting for? Big Pooh: Thank you for your support! We got more coming! "All people see are these over exaggerated images of what they think black culture or hip hop culture is. We just want people to wake up and take notice."